Enner Valencia suffered a "significant injury" to his right knee and ankle in his team's Europa League tie with Astra Giurgiu, West Ham have confirmed. The 25-year-old Ecuadorian fell awkwardly during a challenge soon after heading his side in front in the third qualifying round first leg tie. "I am worried," said Hammers manager Slaven Bilic after the 2-2 draw. "It is too early to say how long Enner's recovery and rehabilitation period may be," the club added. Valencia's injury capped a bad night for West Ham, who face a battle to stay in Europe after letting slip a 2-0 lead at Upton Park. Mauro Zarate added to Valencia's goal but a red card for defender James Collins turned the game. Astra, who host the second leg on 6 August, hit back through Fernando Boldrin's effort and an own goal from debutant Angelo Ogbonna. But it was Valencia's injury that concerned Bilic the most. "I am not happy with the result of course but this is not as important as the injury. 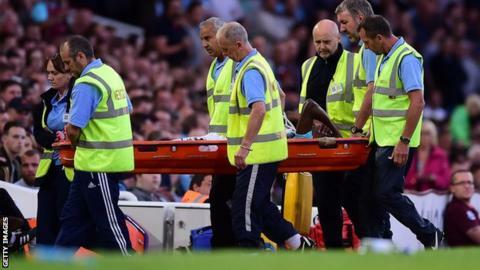 It looks serious but we won't know for sure until he has a scan," added the Hammers boss, who was ordered away from his technical area in the closing stages after rowing with officials. West Ham qualified for Europe through the Fair Play League but Collins' dismissal in the 59th minute means they have now had three players sent off in five Europa League games. Forward Diafra Sakho was sent off against Lusitanos in the first qualifying round, while defender James Tomkins was suspended against Astra after being red carded in Malta.